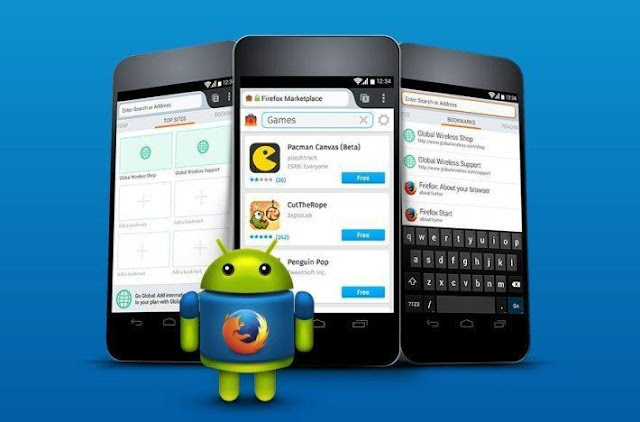 You must be familiar with the Mozilla Firefox app. This is one of the netizen's mainstay browsers to surf the internet. Not only the users of PC / computer, Firefox itself is now also available on an Android smartphone. Of course, this is good news, let alone the features provided are cool and can meet our needs. Well if you have installed and tried this one browser on your android phone? Have you ever had a problem like going out alone when opened? Errors and crashes like this do sometimes happen on some android apps, not just on firefox. When opened, suddenly apk experience force close and appear notif 'Mozilla Firefox has been stopped working'. This kind of problem is enough to make the dizziness of smartphone users. What exactly is the cause? Well practically different, each case is sometimes different. If you are also experiencing the same problem, please read the trick tips that have been we stacking the following. First, open Settings / Settings on your smartphone, then select Apps / Apps. Next, select Mozilla Firefox and then click on the Delete Cache / Delete Cache option. Please try to open the app again, hopefully, it can be used. Just like the first way, you should go to Settings then select Apps then search Firefox and click Force Stop / Force Close then Delete data. Please try to use firefox, usually, this way is powerful enough to overcome it. Sometimes problems like this arise because the applications you use are too outdated. So it should be updated to a newer version soon. That way he will get additional features and eliminate bugs that may exist in previous versions. Please update via Google Play store directly. Go to Settings then select Apps / Applications search and click Firefox then select Remove Installation. After that, you can re-install Mozilla Firefox via Playstore or search for its APK on Google. If all the above tips are not a solution to your problem, maybe firefox is no longer compatible with the device. Please download and install other browser applications eg opera mini, google chrome, puffin or UC browser. Please choose according to your wishes and needs. So how to overcome the Mozilla Firefox force close and like to go out alone. Hopefully with tips above tricks can be a solution 'unfortunately Mozilla Firefox has stopped working. If you still have something to ask, please skip to the comment field.